GIS helps give agencies accurate information quickly so that they can respond immediately to protect clients. Using maps to locate clients in need of assistance means huge time savings. 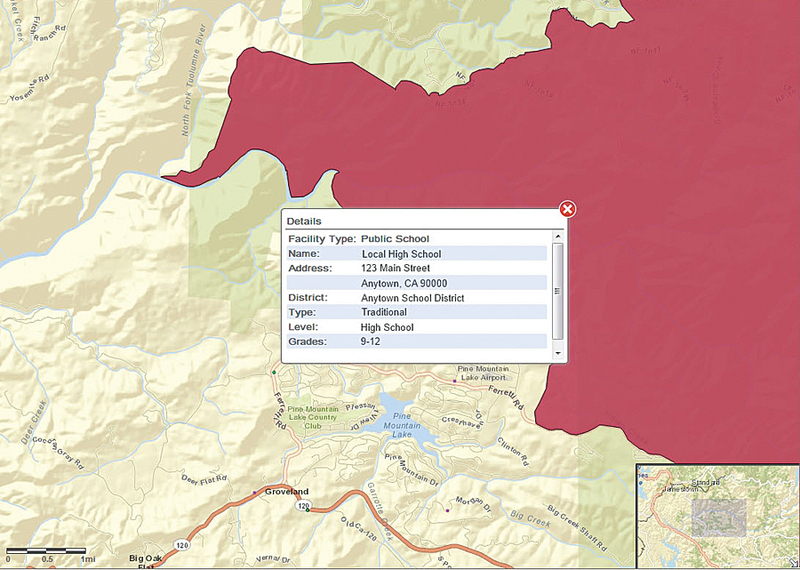 In a stringent fiscal climate, the GIS mapping approach reaps multiple benefits. Human services agencies are responsible for the safety and welfare of clients under their care. Child welfare agencies protect the safety and welfare of children in foster care. Agencies providing supportive services to the elderly must safeguard their clients’ well-being. A given California county may be responsible for thousands of children and adults in homes and facilities spread out over a large geographic area. Rim Fire, 2013. Clicking on a marker opens a panel containing details for that location, including contact information, number of clients, age ranges, and other important elements. When emergencies or natural disasters strike—flooding, fires, and industrial accidents, among other examples—these agencies must quickly communicate with their facilities to keep their clients safe. In California, where wildfires and earthquakes are unfortunately common, this can occur several times a year. San Bernardino County is one of 54 California counties that partner with the National Council on Crime and Delinquency (NCCD) for child welfare data monitoring and analysis through an NCCD service called SafeMeasures. SafeMeasures uses near real-time data to help child welfare agencies in California prioritize work and identify potential gaps in services before they lead to negative outcomes. In 2006, NCCD added mapping to SafeMeasures, geocoding the addresses of all clients and foster homes in the process. 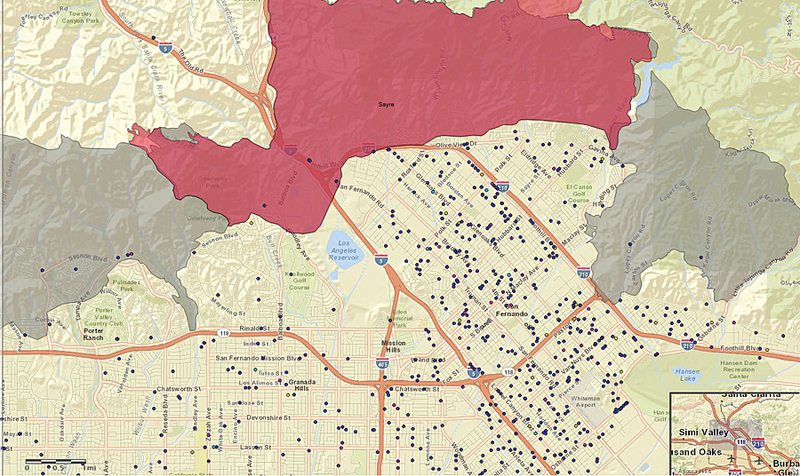 NCCD identified sources of GIS data—such as the National Oceanic and Atmospheric Administration, the United States Geological Survey, and the California Department of Forestry and Fire Protection (CAL FIRE)—that could provide up-to-date information about the location and extent of wildfires, earthquakes, and other disaster situations. Layering client and event information together on a single map created a consolidated source of impact information that made it possible for NCCD’s client child welfare agencies to discard the manual process they had previously used. Sayre Fire, 2008. The map displays the location of foster homes relative to the fire's perimeter. In 2013, NCCD moved to Esri GIS products to improve SafeMeasures mapping. For geocoding, NCCD chose StreetMap Premium for ArcGIS because of its accuracy and coverage, both of which are critical to ensuring that a human services agency reaches all clients potentially affected by a disaster. NCCD works with client, foster home, care facility, and other addresses from multiple states. Because of the confidential nature of this data, NCCD needed to develop a custom, in-house geocoding solution. On a typical day, NCCD geocodes 5,000 to 6,000 addresses. Some days, it geocodes more than 100,000 addresses. ArcObjects, in conjunction with StreetMap Premium data, provides a high-speed, low-cost, automated solution that handles this load quickly and accurately. Other human services agencies are also beginning to use mapping. The Community Care Licensing Division of the California Department of Social Services is responsible for licensing nearly 67,000 facilities serving about 1.4 million California residents. These facilities include child care facilities, foster family homes, children’s residential group homes, and nonmedical out-of-home options for adults. For more information, contact Timothy J. Connell, PhD, director of Application Development, NCCD.